The hatchback reached its pinnacle in 2002, selling 66,836 units, Ward&#8217;s data shows. Annual deliveries have declined since then, except for 2008, the second-generation model&#8217;s first full year. HALF MOON BAY, CA – Toyota is unsure if the Matrix hatchback, whose U.S. sales have sunk steadily over the years, will return when the next-generation Corolla debuts sometime before 2013. “There’s no change right now on the car, (but) we haven’t made the decision yet” on whether there will be a new Matrix model, Bob Carter, group vice president and general manager-Toyota Div., tells Ward’s at a media event here. Originally known as the Corolla Matrix, the hatchback rides on the Corolla sedan’s platform and was introduced to the U.S. in 2002. The Matrix shares a platform and powertrain with the now-defunct Pontiac Vibe, although the Vibe was built at a former joint-venture factory owned by Toyota and General Motors in Fremont, CA, while the Matrix is assembled at Toyota’s Cambridge, ON, Canada, plant. The hatchback reached its pinnacle in 2002, selling 66,836 units, Ward’s data shows. Annual deliveries have declined since then, except for 2008, the second-generation model’s first full year. However, Matrix volume plunged 47.3% to 26,121 in 2009, from 2008’s 49,567, and last year slid 44.5%, with only 14,492 deliveries. Hatchbacks and wagons in the C-segment and larger traditionally have not sold well in the U.S. However, a renaissance of sorts is taking place among Toyota’s compact competition. The new Ford Focus, Hyundai Elantra and Volkswagen Jetta all have a hatch or wagon variant, while the Mazda3 and Subaru Impreza continue to offer a 5-door. Ford has said its Focus 5-door, introduced to the U.S. in March, to date accounts for 43% of the ’12 model’s sales, while 9,704, or 17%, of the 57,975 Jettas sold through April were wagons, Ward’s data shows. Through April, Matrix deliveries were down 37.3%, compared with year-ago, although Carter says that is somewhat by design as Toyota prioritizes production of Corolla sedans to meet U.S. demand during the ongoing Japanese parts shortage. 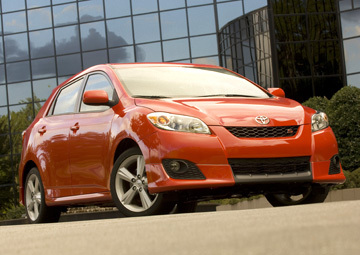 While the Corolla is the most popular model among American buyers, the Matrix sells well in Canada, making for a difficult decision whether to keep the hatchback in Toyota’s lineup. “It’s huge in Canada,” Carter says, noting the region’s winter weather makes the all-wheel-drive Matrix a core vehicle there. But so far this year, the Corolla has been outselling the Matrix in Canada, albeit by a smaller margin than in the U.S.
Canadian Matrix sales through April totaled 5,418, compared with Corolla’s 13,480. In the U.S., where combined sales are reported, just 4,135 of the 100,890 Corolla/Matrix models sold this year were hatches. Carter dismisses the notion Toyota’s upcoming hybrid compact, based on the Prius C concept shown at January’s Detroit auto show and due next year, will supplant the Matrix. The two models likely will appeal to different buyers he says, in much the same way the D-segment Prius and Camry attract distinct demographics.